Lunasol's ever-popular Christmas coffret series continues this year with a new limited edition Lighting For Eyes palette, a silvery pink Geminate Liner, a shimmery pink lipgloss and a shimmery face powder in an original box. This looks like a bit of a disappointment since the Lighting For Eyes series have never been as popular as the newer Skin Modelling Eyes or Geminate Eyes palettes. The shades in the quad are once again neutral browns and beiges that will appeal to a larger audience with more conservative tastes. The box makes it a convenient gift but a cute little pouch would have been much more useful. Most of the comments on 2Channel so far have not been positive as most people had been expecting a new Skin Modelling Eyes or Geminate Eyes palette. The new quad also looks very similar to last year's Christmas quad. The new Geminate Liner is supposed to be quite different from Geminate Liner Diamond. The Christmas version is more translucent with less color payoff but it has intense holographic shine. Kanebo counters will start taking reservations for the coffret on 1 October in Japan. Hot on the heels of its hit Color Conc Rouge liquid lipsticks, Lavshuca will be introducing another compact sized liquid lipstick, Liquid Rouge, on 1 November in Japan. Liquid Rouge will be available in 12 shades and it is supposed to be pigmented with high shine. It contains almond oil for deep moisturising benefits and silk powder for a soft finish. Lavshuca's target audience is ladies in their late 20s to 30s who tend to put more emphasis on lip makeup rather than eyes. Hence, Lavshuca's plethora of new products for the lips, most of which come in a handy compact size that is easy to tote around. Autumn is not even here but Kate is already gearing up for its winter collection are already out! The star product of the collection is the new longlasting, pigmented and high-shine lipgloss, Wrapping Enamel Gloss (1260yen, 4 shades). According to the press release, Kate's color makeup up to now has been focused mainly on the eyes as its typical customer is mainly interested in how to make her eyes look bigger. 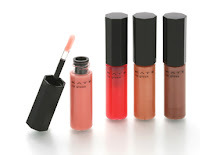 Hence, the lip products have tended to play down the lips with translucent lipglosses or lipsticks. With the new Wrapping Enamel Gloss, Kate is bringing the spotlight back to lips. The Wrapping Enamel Gloss has a spatula applicator which will enable a thicker application. Kate will also be introducing 5 new shades of Lipgloss N (the one that comes in tube; 504yen) and 2 new shades of Liquid Rouge (1470yen). The collection will be launched on 1 November in Japan. Click here to watch the new Esprique Precious Rouge Stylish Fine Color tv commercial featuring model Gemma Ward who is wearing shade PK840. There is also a clip showing the making of the commercial. Shu Uemura is also releasing a new cream foundation and a cleansing oil on 1 September in Japan. The new Cleansing Beauty Oil Premium A/I (9450yen for 450ml; 3570yen for 150ml) contains a blend of Asian plant extracts and Western herbs such as lavender, camomile and bergamot, plus amino acids for moisturising benefits. 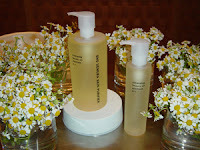 It is Shu's first medicated cleansing oil developed specially for sensitive skin and includes ingredients such as flower oil and avocado oil. It is supposed to help prevent skin dryness as well as acne. 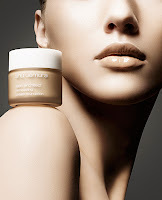 The new Cream Foundation (5040yen for 30g) comes in 8 shades with SPF 11 and PA++. Deep sea water makes up 18% of the foundation and it also contains emollient oils for moisturising benefits. 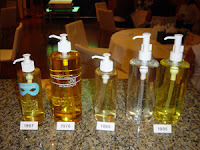 Here are some photos from the press launch party, including a display of the different versions of Cleansing Oil over the past four decades. Jill Stuart's new Moist Silk Liquid Foundation will debut on 14 September in Japan. According to the JS website, it has a "Soft Volumey Formula" for a velvety semi-matte finish that also provides good natural coverage of pores. The micro silk chiffon powder help to create a soft focus effect and the ingredients do include oil for deep moisturising benefits so this is meant more for dry skintypes or use in autumn/winter. 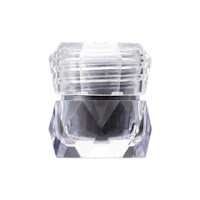 It also contains a "pure crystal powder" and has a "crystal floral bouquet" aroma plus SPF18 and PA++. It retails for 4200yen and is available in 5 shades. Every year, Plaza Style (formerly known as Sony Plaza) releases various popular products from various makeup brands in a limited edition packaging that's exclusive to Plaza Style stores. Here are the pics of the new items which will be in Plaza Style stores in September. The Cosmetics Market in New York is mentioned quite frequently on MUA, primarily due to its large stock of Stila products for greatly reduced prices so I decided to visit it yesterday. Overall, I would say it was a disappointment. It does have a huge selection of brands from Revlon, L'Oreal, Maybelline to Stila, Anna Sui and even Prada skincare. But a lot of the stock looked so old that I wouldn't be comfortable putting them on my face, much less on my eyes. There were some good deals, to be sure such as the Stila Sakura trio which was only $6.99. The Sakura trio was released in March 2006 so it should still be safe to use but unfortunately, it's one of the most unpigmented trios that Stila has ever produced. They also had Convertible Colors in Forget-Me-Not and Rose plus a wide range of the eyeshadows including discontinued colors like Mango plus current ones like Kitten. They also had the #9 Blending Brush, a small retractable brush in a blue metal case, Midnight Bloom perfume ($25) and body lotion as well as Jade Blossom shower gel and body mousse ($7). I was surprised to also find Manifesto by Isabella Rosellini foundations here but since Manifesto was discontinued at least 4 years ago, I seriously wouldn't dare to try any of it. They also had Urban Decay Eyeshadow Transforming Potion but I wasn't confident about the age of the stock so I skipped it. The Cosmetics Market is on 39th Street between 5th Avenue and Madison but there was a sign in the store that said it would be moving but I can't remember the new location...sorry! The new October issue of Voce magazine focuses on base makeup techniques for the fall, in particular how to create a so-called "airy matte" look, a departure from the glowy look that has been in vogue for the past few seasons. Also in this issue are makeup tutorials for beige-themed makeup and a list of 130 must-have items for base makeup. The magazine also comes with a free Paul & Joe pouch and samples of their new primer and foundation. The cover model is a popular actress Norika Fujiwara. The November issue of Maquia will come with a ribbon necklace, Impress Concentrate Mask N (a high end department store brand by Kanebo) and a Clinique plastic folder) to commemorate the magazine's 3rd anniversary. Hi, ladies! I'm back finally after completing my move from Tokyo to Singapore and then to New York. I arrived in NYC last Thursday, moved into an apartment in West Harlem (which is apparently not as bad as East Harlem) and am still adjusting to life as a student again. After spending 4.5 years in Tokyo, coming to New York was quite a big change. Tokyo has a few million more people than New York but it is so much cleaner and advanced than New York. Taking the subway in NYC is honestly, a torture as it's like bathing in really awful toilet fumes each time. The trains run 24 hours in NYC unlike Tokyo but there is no train schedule or even electronic signboards that post alerts on incoming trains. The announcements are a total mystery. And there are rats. After two days here and a disappointing trip to the Sephora store in Times Square (terrible testers and lots of items out of stock), I was dying to just pack up and go home. I also ventured into Saks 5th Avenue and walked around the cosmetics counters but the SAs just looked so intimidating. It didn't help that most of them also towered over me! I miss Tokyo.... sigh. The Revue website has been updated with the latest TV commercial, wallpaper and screensaver. The Integrate website has also been updated with the new autumn collection and advertisements featuring Angelina Jolie. I checked out the new eyeshadow quads in the store and the quality was quite disappointing, to be honest. The eyeshadows were quite sheer and the colours were blah. The three new Glamorous Rouge lipglosses were also not that tempting. Two of the shades were quite pale, which means they will hardly show up, while the deep wine shade had glitter which I don't like in lipglosses. The Raycious website has been updated with the TV commercial, photos from the shoot, wallpaper and makeup tips. Check it out here! So I'm back in Singapore now. I was happily surprised to discover that RMK and Lunasol have opened counters in Terminal 1 South Wing of Narita Airport this morning. 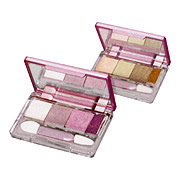 As Lunasol was giving away a compact mirror with any purchase of an eyeshadow palette, I finally picked up the Geminate Eyes #4 Sapphire and #5 Ruby for myself :-) There's no better excuse than a GWP plus tax free, right? The Lunasol prices were basically the retail price excluding the usual 5% sales tax but RMK was quite substantially discounted by about 25%. 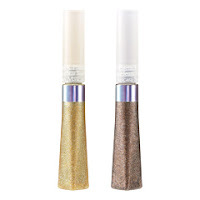 For example, their W Lip & Gloss which retails for 3990yen at the city counters was selling for only 3000yen. There was also a travel exclusive #1 Lip Palette with 10 shades that was 4000yen. They carried almost the full range but did not have the Jelly Eyes. Lunasol also had a trio of nail polishes for the price of two (3000yen) and a travel exclusive lip palette. The lovely SA also gave me a HF White Aroma Basic Charm set that included a Brightener (20ml), Emulsion (20ml) and Conditioner (30ml). Singapore Airlines flies from T1 South Wing so do take the opportunity to check these out if you're there! The RMK and Lunasol counters are at the cosmetics store on the left hand side after the Customs counter. Shu Uemura also has 2 counters in the South Wing with the products discounted fairly substantially like RMK, more than the 5% sales tax. 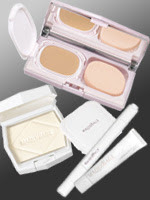 Maquillage is also available in the duty-free but only without the 5% sales tax. Other brands available are MAC, Bobbi Brown, SKII, Anna Sui, Chanel plus the usual EL, Clinique, Lancome. Anna Sui and Chanel already had the fall collections out. MAC had the Paint Pots, 3D glosses and Flashtronic. Palgantong, a Korean brand, has a popular line of products that is sold in many drugstores and specialty stores in Japan. Their star product is the Theatrical Powder which comes in 10g, 30g and 50g versions. Each year, Plaza Style (formerly known as Sony Plaza) releases limited edition versions of hit products from various brands in a special packaging. The photo at left shows the new limited edition version of Palgantong Theatrical Powder which will be available at Plaza Style stores starting 1 September. It certainly looks much prettier than the usual Palgantong packaging! I think this should be the 10g version which retails for 798yen. Plaza Style stores can be found in Harajuku, Shibuya (B2 of the 109 Building), Ginza and Lumine in Shinjuku. For those of you planning to travel to Japan, Sweets Sweets' new Mixing Palette (777yen, 4 shades) is another little gem worth checking out. #1 is a palette of varying shades of white. #2 has a baby pink, peach and very pale golden white shade. #3 features bright shades of raspberry pink. #4 has coral and tan shades. 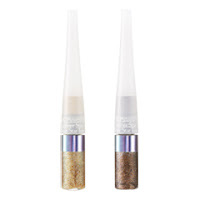 All the shades have a very fine micro-shimmer without big glitter particles. Out of the four, #2 is the easiest to work with as #3 is a bit too bright pink for anyone who's no longer a teenager. The shades are all very silky and surprisingly pigmented and you can create a number of different looks by mixing and blending the shades together. 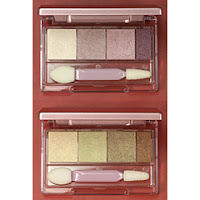 The lightest shades in each palette can help to tone down the other colors while adding more glimmer. Just two more days before I leave Tokyo so naturally I had to go around my favourite haunts. Picked up the new Kanto region-exclusive version of the Bihada Ichizoku Sheet Mask (pack of 4 for 1800yen) and the new Kurobara Kamen Sheet Mask (450yen for one sheet) which comes in a distinctive jet black packaging. The Kurobara sheet mask itself is also black, unlike the usual white sheet masks. The Kurobara version contains extracts of artichoke, daisy and yellow flax as well as alpha arbutin while the Kanto-exclusive version has an apple scent and extracts of ginseng, lettuce, tomato and nutto (fermented bean). The other regional versions include Hokkaido (lavender fragrance and crab essence[?! ]), Chubu (grape fragrance and grape extract), Kansai (orange & lemon fragrance and tea extract) and Kyushu (strawberry fragrance and extract). These are the Kyushu and Kansai versions. 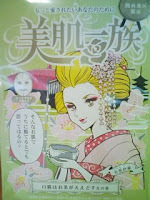 I also picked up the Testimo DG-01 single eyeshadow that was just released as part of the autumn collection. It's a gorgeous deep emerald green. Do check it out if you can! 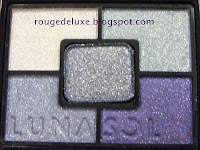 I finally picked up the new Lunasol Geminate Eyes palettes yesterday! As you can see from the pics, these are vibrant, shimmery colors in accordance with the precious jewels theme. The pan in the centre of the palette is a glitter shade that can be applied on top of the rest of the eyeshadows. It feels grittier than the other four eyeshadows. The other four eyeshadows have a very smooth and silky texture with a fine shimmer, like the Skin Modelling Eyes series except the Geminate Eyes shades are brighter and much more colorful. #1 Cat's Eye and #2 Alexandrite are probably the easiest to wear but personally, I prefer #4 Sapphire and #5 Ruby just because those are my kind of colors. In particular, the dark lavender shade in #4 Sapphire is a beauty. I didn't get #3 as the shades were too icy for my liking and I tend to prefer more dramatic colors. The good news is that these are all permanent so one can take one's time collecting them. I believe they should be released in Singapore in September. Lunasol is currently also available in Hong Kong and China but I'm not aware of any online shops that sell Lunasol although one can always try Ebay. Of the 167 reviews currently on Cosme.net, the average rating is 5.6 stars out of 7, which is quite high with many reviews praising the color selection and good color payoff. Cosme.net has listed a new Kiss release on 23 September that will include a new Moist Base UV Nuance Color (1680yen) in 3 shades and Pure Bloom Cheeks (1470yen) in 4 shades. My guess is that these will replace the Nuance Milky Base UV and Dual Fairy Blush. 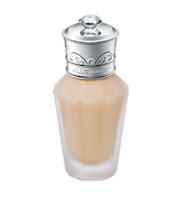 The Moist Base is a moisturising makeup base for dry skin types and has SPF 20 and PA++. Pure Bloom Cheeks is a two-toned blush powder with fine shimmer in a gold case with a heart logo embossed on the surface of the blush powder. It contains chamomile extract for moisturising and like the current Dual Fairy Blush, it comes with a brush. But there's a price increase compared to the Dual Fairy Blush which is 1260yen and the Nuance Milky Base UV is 1470yen. If they improve the cheap plastic packaging of Dual Fairy Blush, I guess that's not too bad. The RMK website has been updated with the fall collection, Beigy Colors. There is also a special website dedicated to the collection that includes an interview with the model and an 8-minute video of the shooting of the print ad. 4. 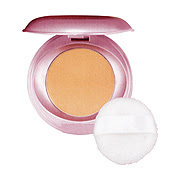 New shade of Pre Makeup Skin Brightener in Natural Yellow SPF10, PA+ (3150yen). The new Climax Moisture Compact is supposed to give a more glowy and natural finish compared to powder foundations. It is also more moisturising with a non-sticky texture. The reviews on Cosme.net are so far all positive (averaging 5 stars out of 7) with several praising its good coverage of flaws, ease of application and moisturising properties which is suitable for dry skin types. The collection is due out on 21 August in Japan. The Love Clover website has been updated with the new Marshmallow Fit Base UV N (1890yen) in #5808 Choco and #5809 Natural Ochre. #5808 Choco is good for covering pores and has a mattifying texture whereas #5809 Natural Ochre is foor for covering pores and acne scares and has a moisturising texture. Both contain moisturising ingredients such as marine collagen, Vitamin C and lavender extract in an oil-free, unfragranced formula that is also targetted at skin with acne scars. The new Kiss collection is up on the official website! They also have pics of the new Eye Prism Gradation palettes (1680yen) as worn on the model plus detailed diagrams on how to apply the eyeshadows. The collection will be launched on 25 August. The model is wearing Rouge Melty Syrup #8, Eye Prism Gradation #3 Lady, Mascara Glamorous Volume WP 01, Prism Jewelry Eyeliner 01, Dual Fairy Blush #2, Nail Enamel R #46 Ginger Cookie and Nail Decoration #1. 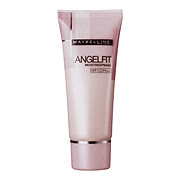 Maybelline's Angel Fit base makeup series is formulated specially for the Asian market. Following the release of the Angel Fit powder foundation earlier this year (with last year's Miss Universe runner-up Kurara Chibana as the spokesmodel), Maybelline will be adding a liquid foundation and makeup base to the line-up in September. 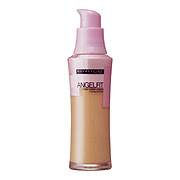 Angel Fit Liquid Foundation (2205yen) comes in 6 shades and has SPF17 and PA++ while the Moist Keep Base (2100yen, SPF15, PA++) has pink pearl for a glowy effect. Just found these pics of the Gransenbon collection due out on 31 August. To recap, there will be a new Pore Cover Powder #1 Poreless Beige (1680yen) and two new Gran de Eyes palettes (1680yen) #18 Evening Rose and #19 Noble Forest. #18 Evening Rose looks like gorgeous and just the kind of palette that I would use frequently. Praying that they will be released early! But they're all permanent anyway so I can still get them if I come back next year. I received a sample of Paul & Joe's upcoming new Moisturising Compact Foundation (5250yen, 6 shades) in #30 today and tried it out immediately. The color match was surprisingly not too bad although it had looked too yellow and dark for my MAC NC20 skintone. 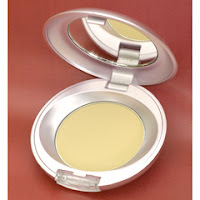 It is a cream compact foundation that is more suitable for dry skin or use during the fall/winter. I was quite impressed with the pretty packaging of the sample which is adorned with the P&J flower print! I have incredibly oily skin so I wasn't expecting this to work miracles for me but it had a more matte finish than the new Light Cream Foundation N (which comes in a glass bottle) and better coverage. It took quite a bit of work and a fair bit of dusting with loose powder to make it look somewhat natural. It did cover the redness in my cheeks but I still needed a separate concealer for my dark circles. It didn't feel sticky or heavy which is a plus. I wore it for about 3.5 hours this evening (bear in mind, it's very hot and humid in Tokyo right now) and by the end of the evening, I had quite a bit of shine in my T-zone. All in all, this didn't work too well for me as I can get a more natural finish and better oil control with the powder foundations that I've been using (Esprique and Revue) with much less effort involved in applying and blending but then again, this was meant for dry complexions. Pics of the new limited edition Raycious foundation compact case which just arrived in stores this week. It looks nicer in real life than in the photos as the lid is inlaid with a layer of silver shimmer throughout and the polka dots are not a single color but a gradational metallic purple shade. 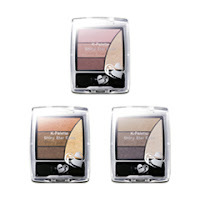 K-Palette's fall collection theme is Exotic Safari featuring a palette of glamorous golds, tans and mysterious black. The new eyeshadow quads include three gradational shades and a highlight colour that has "flash pearl" for extra sparkle. Release date is 7 September in Japan. 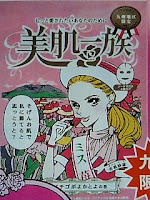 K-Palette is made by the same company that owns Gransenbon.